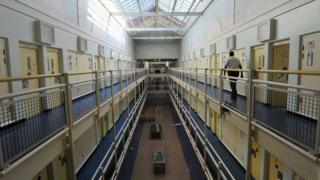 The prison system in England and Wales is "in crisis", according to the Howard League for Penal Reform. The charity claims the number of prison officers has been cut by 41% during the Government's time in office. Howard League chief executive Frances Crook said: "These are desperate times and ministers are resorting to desperate measures." But the Ministry of Justice disputed the figures, saying the reduction in officer numbers was actually 27%. Analysis of official figures showed there were 14,170 officer-grade staff in state-run prisons at the end of June 2014 while there had been more than 24,000 at the end of August 2010, the charity said. The cuts include 1,375 officer posts lost with the closure of 15 public-sector prisons. A Ministry of Justice source said the Howard League was not comparing like with like and that the period had seen a fall in prison officers from 24,580 to 17,971. Ms Crook said: "The prison system is in crisis, and these figures reveal why. "While the prison population has grown, officer numbers have been cut without any thought for the consequences. "A shortage of governors makes matters even worse, because officers are being taken off the wings and asked to 'act up' to fill vacancies. "Having made prison officers redundant, the Ministry of Justice is now apparently struggling to recruit. These are desperate times, and ministers are resorting to desperate measures." She said the only solution to the crisis was to have a "hard look at who we send to prison and why" and reduce the prison population. Prison Governors Association president Eoin McLennan-Murray also warned last week that prisons were facing a "tipping point" with staff who are "worn down, tired, over-worked". Shadow justice secretary Sadiq Khan said: "Ministers have caused this crisis by closing down too many prisons too fast and cutting staff while the number of prisoners has gone up. "Less and less is being done to rehabilitate offenders - so unreformed prisoners will be released from jail risking public safety and creating more victims." But Prisons Minister Andrew Selous said: "It's beyond me why the Howard League go out of their way to deliberately mislead the public on the state of our prisons. "They are less overcrowded than they have been for a decade and they are well-run, due to the dedication of the hard-working staff in them. Consistently trying to claim otherwise helps no one."